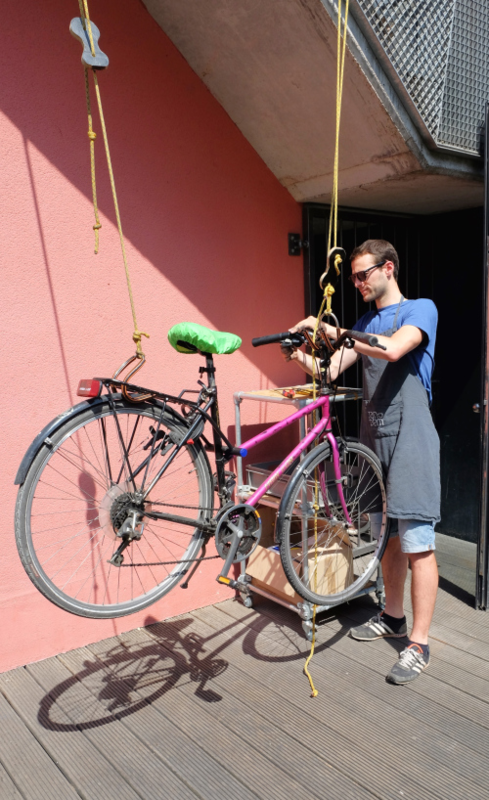 The concept of Tandem FietsCaféVélo is simple and cool : a combination of bar, bicycle workshop and bike accessories store, where bikes and families are welcome. Céline & Florent, the young couple behind the project, tested it for the first time last summer in the Orangerie of the Jean-Félix Hap Park in Etterbeek. In view of its success, they decided to try it another time and found again a pretty cool location : the Centre Communautaire Maritime in Molenbeek. 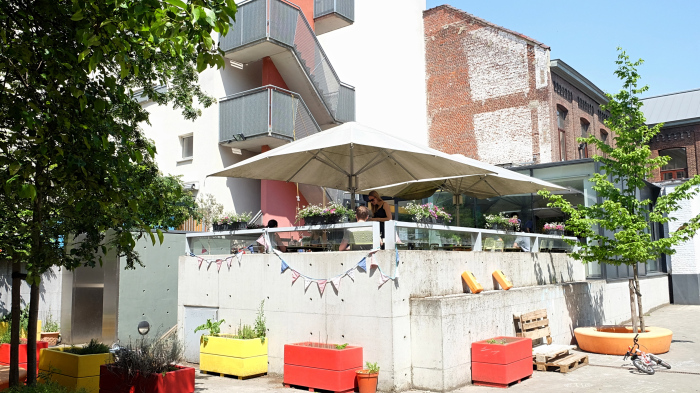 A few blocks away from Tour & Taxis and the canal, the Centre Maritime regularly organizes sociocultural activities like Molembike, Molembeek’s bike festival, last weekend. 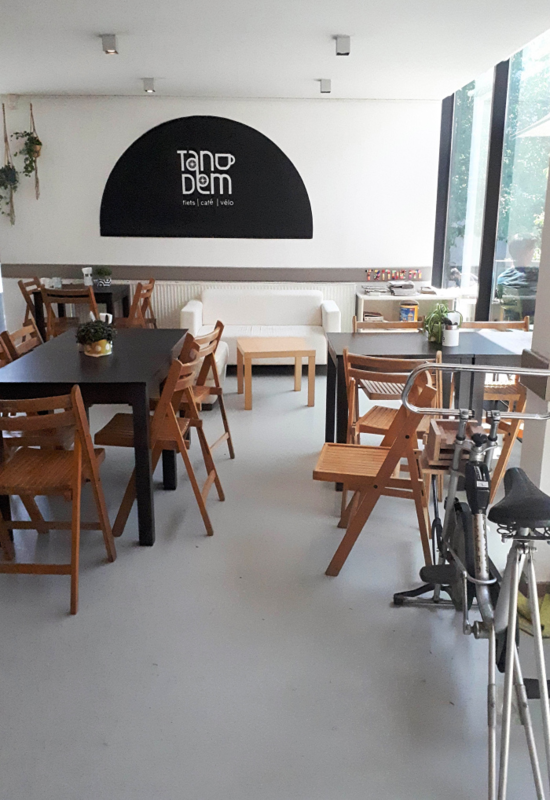 Tandem invades the Centre’s cafeteria and backyard until 14th July and makes it a bright yet cosy meeting place for bike lovers, bunches of friends and families. Open from Wednesday to Sunday, it proposes every day bike related animations like the Bibliocyclette who reads stories to the children, bakfiets testing, wine tasting (with the Viniporteur of course ! )… but you can simply grab a bite or have one of the local beers on the menu. On Saturday and Sunday, it’s brunch time ! A fresh and tasty buffet with lots of home made meals (don’t miss Céline’s eggs in a bacon cup nor the chocolate and cherry cake). Emma who is such a fussy eater emptied her plate 3 times (chuuuuut…. !) 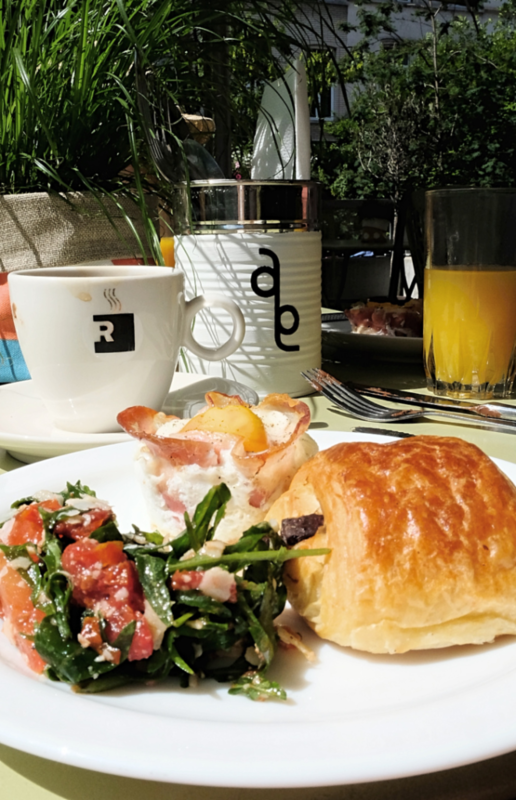 and we totally enjoyed our quiet brunch on the terrace overlooking the courtyard where the kids play and… bike (what else). At the workshop, mechanics help you repair your bike or you can just use their equipment to do it on your own. In the shop you’ll find bike related items like T-shirts, books, gadgets and magazines. Céline and Florent live in the Marolles with their 2 children. They accepted to answer a few questions about Tandem and the life with kids in the city. Could you sum up your project in one sentence ? Tandem is a kids friendly place where you can take your time to have a good drink, eat something tasty, make your bike repaired by a pro, enjoy activities or buy a nice goodies. When and how did you decide about starting Tandem ? We launched Tandem as a couple because we wanted to open something since a long time but we just missed the concept. One fine day we realised that a bicycle café could be THE concept that gathers all the things we care for: good food, bicycles, kids, beer and coffee! After this second pop-up, if it’s a succes again, our intention is to find a place in Brussels where we can stay permanently. What is your vision about biking in Brussels ? You live in Brussels with your two children. What do you like or find difficult about being parents in the city ? We appreciate everything is so close from home and all the opportunities that offers for children. But on the other hand, we realise that Brussels misses public and private places where you can just let your children play and run easily and safely. 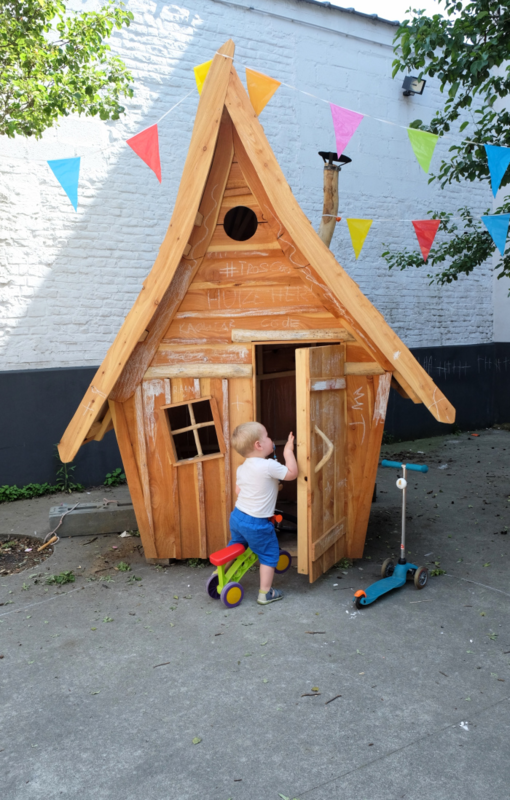 What are your favourite spots/activities with in Brussels (with and without the kids) ? 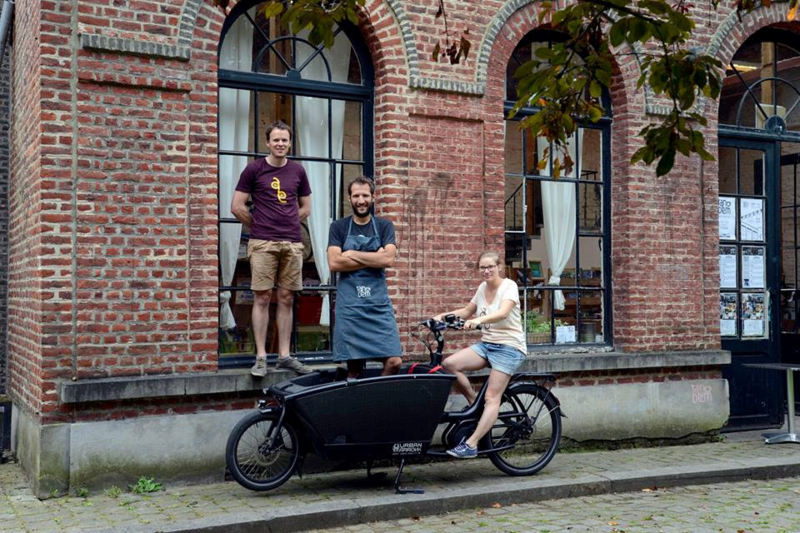 Tandem FietsCaféVelo is open from Wednesday to Sunday until July 14 at Centre Communautaire Maritime (Rue Vandenboogaerde 93, 1080 Molenbeek). More information on the website, Facebook and Instagram. This text was published at the blog A mother in the city.